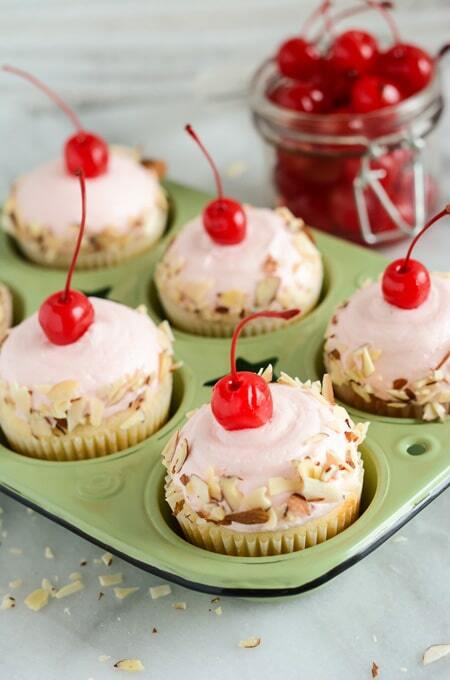 These Cherry Almond Cupcakes remind me of something from a cupcake bakery. And definitely something I would pick back when I was a kid. I absolutely loved anything cherry when I was young and still do! 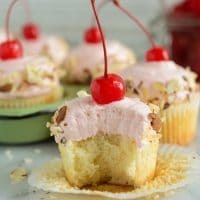 These Cherry Almond Cupcakes might even remind you of those fun Shirley Temple drinks, which was one of my favorites when I was a kid! You’ll get a fluffy homemade almond cake, topped with a homemade cherry buttercream made with maraschino cherry juice! 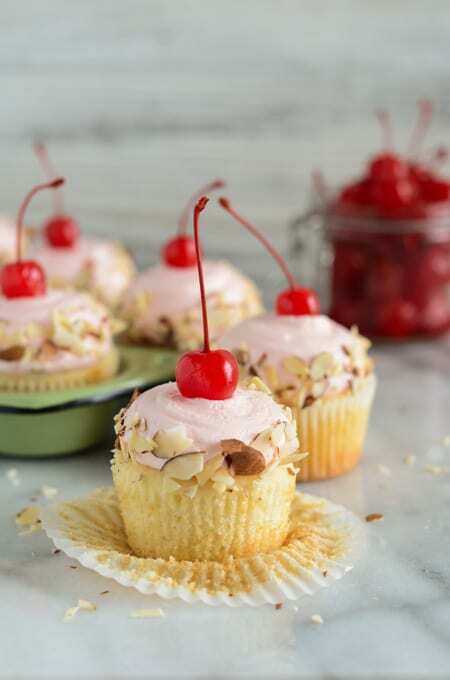 Finish the cupcakes off with some sliced almonds and a maraschino cherry! 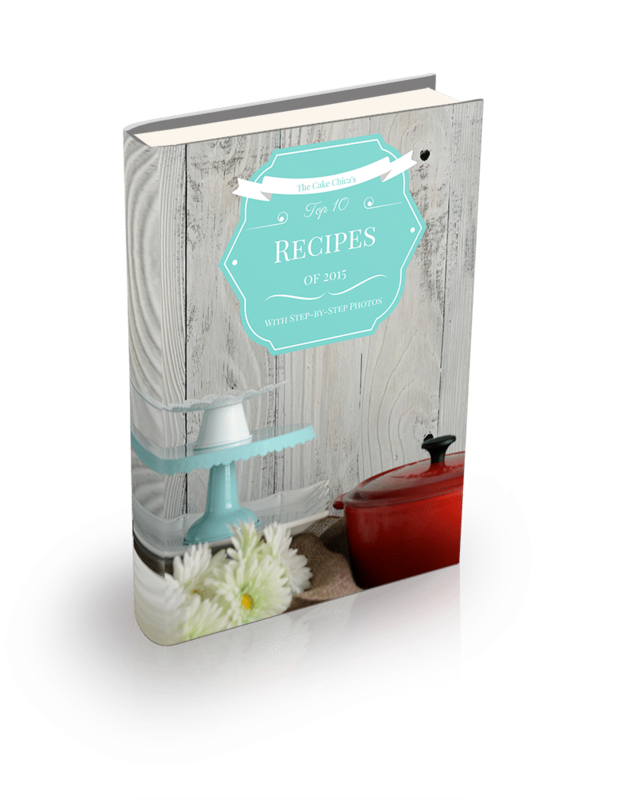 Use a piping bag fitted with a large round piping tip and pipe frosting on top of the cupcake directly in the center for 3 counts, stop pressure and release and move piping bag away. The easiest way I found to get the almonds on the sides of the frosting was to grab a few almonds in one hand, and in the other hand hold the cupcake at an angle and gently press the almonds on the sides of the frosting. Maraschino cherries are full of juice. In order to prevent the juices from leaking all over my frosting, I rinse the juice off the cherries first and then pat them dry with a paper towel. Let the cherries sit out for a few minutes and gently press a paper towel around them one more time to get any remaining juice out. 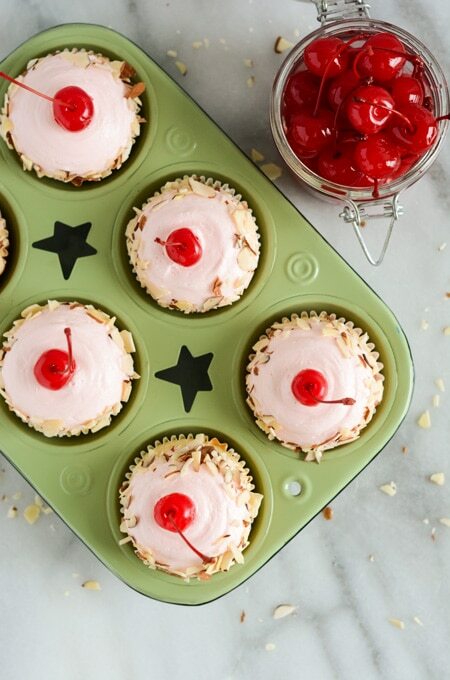 Then top your cupcakes with the cherries. Follow The Cake Chica on social media: Facebook, Instagram, Twitter and Pinterest. 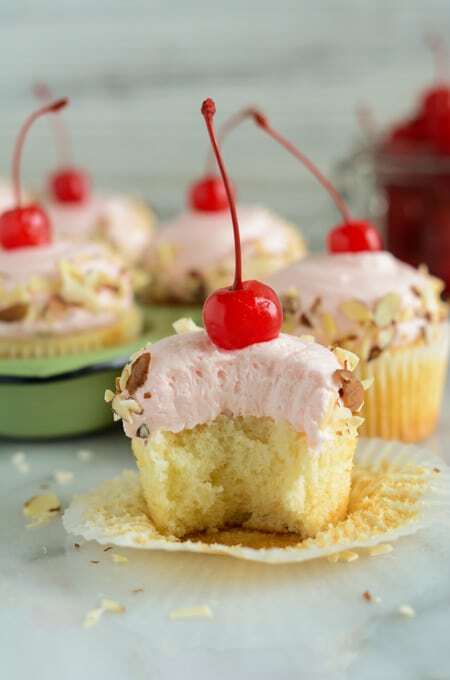 Fluffy Almond Cupcakes, topped with maraschino cherry flavored buttercream frosting and garnished with slivered almonds and a maraschino cherry. Heat oven to 350 degrees. Line a cupcake pan with cupcake liners and set aside. In the bowl of a stand mixer, cream the butter and sugar together until light and fluffy on medium-high speed for about 3 to 4 minutes. Add the sour cream and almond extract and mix until well combined. Add egg whites one at a time mixing after each addition until well combined. Scrape down the sides of the bowl as needed. Add the flour, baking powder and salt in a medium bowl and whisk to combine. Pour milk and water in a small measuring cup and stir to combine. Add half of the flour mixture to the batter and mix until well combined. Add the milk mixture and mix until combined. Add the remaining flour mixture and mix until well combined. Fill the cupcakes liners half way full with cake batter. 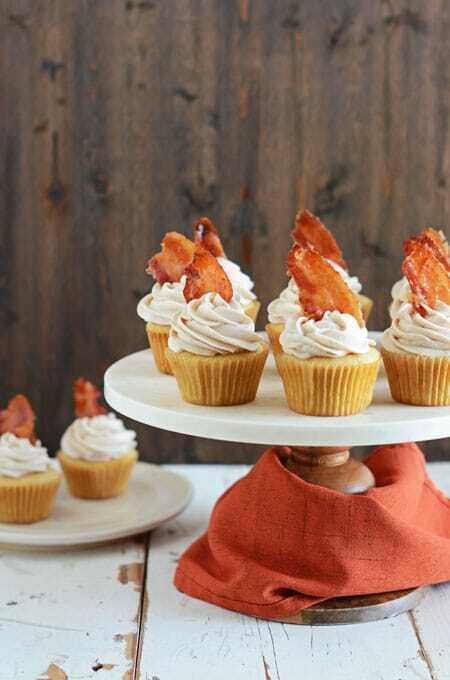 Bake cupcakes for about 15 to 17 minutes or until a toothpick inserted in the center comes out with a few moist crumbs attached. Rmove the cupcakes from the oven and allow to cool in their pan for 5 minutes, then transfer them to a cooling rack to cool completely. Beat the butter and shortening in a bowl of a stand mixer until smooth. Add 2 ¼ cups powdered sugar and beat until smooth. Add the maraschino cherry juice and beat until smooth. Add the remaining 2 ¼ cups powdered sugar and beat until smooth. 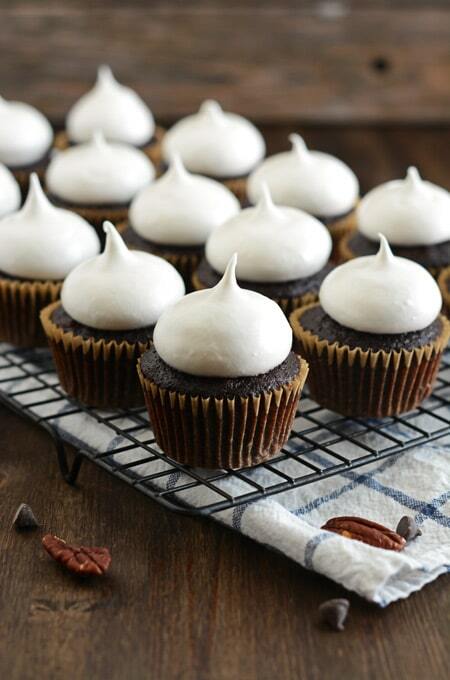 Using a piping bag fitted it a large round tip, pipe frosting on top of cupcakes. 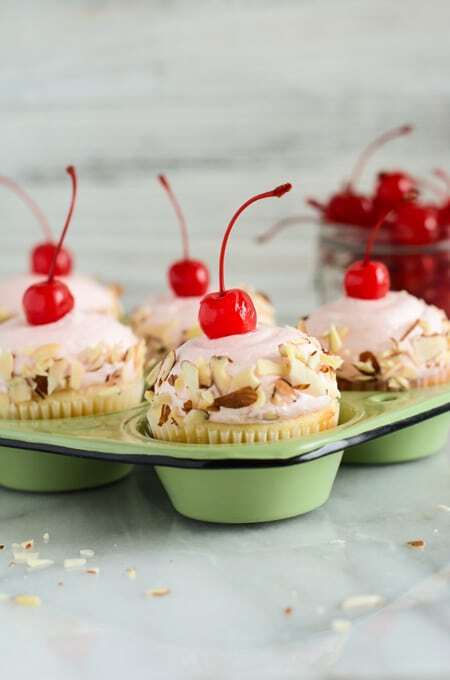 Place chopped almond slices around the edges of each cupcake and top with a maraschino cherry. 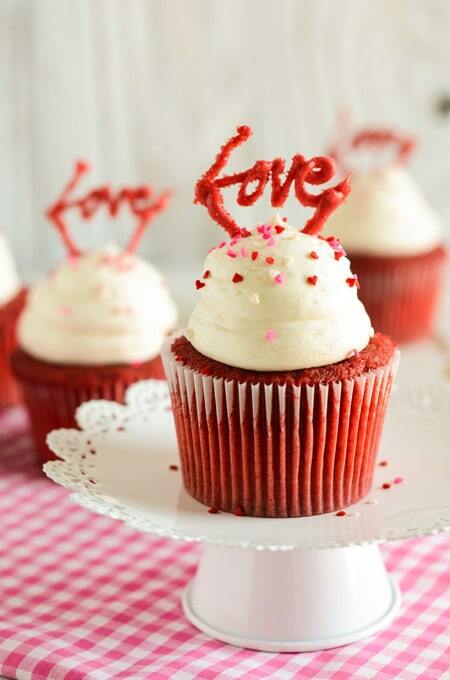 MAKE AHEAD: Store unfrosted cupcakes in an air tight container at room temperature for 3 days. STORE: Store frosted cupcakes in the refrigerator, in an airtight container for 2 to 3 days. Bring to room temperature before serving.